DELTA® Geo-Drain Quattro is a compact four-ply drainage sheet for vertical construction applications. It is used for protection and waterproofing applications, both above and below ground. 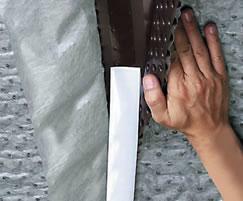 It comprises four layers: a micro-perforated slip film, a laminated cloth, a dimpled sheet with integrated self-sealing edge, and a permanent filtration geotextile. 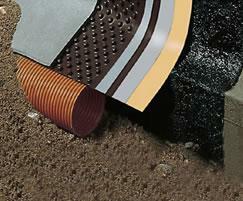 DELTA® Geo-Drain Quattro provides safety for thick viscoplastic coatings. It maintains integrity even if driving rain is able to penetrate through an imperfectly installed upper edge trim. In an absolutely watertight system, such rainwater would exert hydrostatic pressure on the waterproof coating. However, DELTA® Geo-Drain Quattro ensures that any water is drained off safely. In addition, the slip film prevents the transmission of movement to the waterproof coating. Accessories include edge sealing strips, self-adhesive pins that aid installation, a plastic wall plug for sheet attachment, and installation clips for swift and easy fastening.